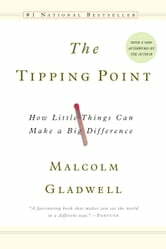 Gladwell presents some compelling arguments about the way ideas and behaviors spread in a very accessible way. Good use of examples, interesting categorization. Not a bad read over all. The extensive research with which Mr. Gladwell states his case is very impressive. It is easy to understand why the contention is made and why it should be true. There is lots worth pondering throughout the entire book. I enjoyed it immensely. This is a great book about how marketers and researchers combine with the average public members and create fads, trends, and various educational events. Tipping point is also a great recommendation for entrepreneurs and job seekers looking for ways to affect their personal or professional outcomes.